Jeremy Haun takes cuts to the chase, brings the action to the forefront, and forgoes backstory to drop you right into this post-apocalyptic fantasy world. The opening sequence feels like a Western in an urban setting. Will Nolan, a mercenary-for-hire type, escorts a woman on horseback on the way to meet the "King" who's kingdom apparently resides inside an abandoned Costco. He's clearly in a territory run by one faction but also one that hired him to return the woman. While it's an intriguing set-up what stands out right away is Jeremy Haun's pencils. There is an intricate attention to detail from the background to the foreground. A lot of thought has been put into conveying this decaying urban landscape and Haun is unleashed, given the storytelling duties through his art for several pages at a time without virtually any captions or dialogue. While this dystopian future may look familiar, it's not zombies, vampires, or robots you need to worry about. Peck has mashed genres together by taking mythical orcs and dragons out of medieval times and made them the catalyst for the downfall of civilization and the humans that remain must band together against a powerful sorcerer. However, Peck cleverly doesn't give it all away in issue one. There's no exposition about what happened, no flashbacks, just a guy doing what he knows best and another group of survivors fighting back against the monsters lurking around corners. It all comes full circle by the end of the issue which sets Nolan off on another journey but Peck isn't holding your hand, he's dropping you in the middle of the action and you just have to enjoy the ride. It's the proverbial "get in loser, we're going on a road trip" type of adventure and it's completely irresistible. 'The Realm' #1is this week's surprise hit. 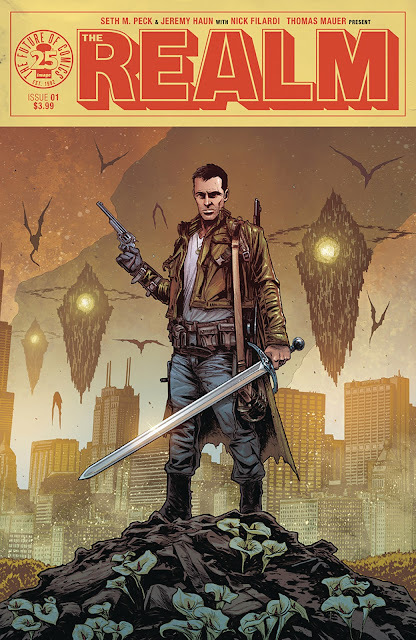 Peck and Filardi mix it up and deliver a compelling and exciting post-apocalyptic high-fantasy that hooks you with precise execution and stunning art. It defies conventional storytelling to let the reader hit the ground running and tease some fantastical elements that are left to be explored. 'The Realm' doesn't waste any time and it won't waste your money. It's worth every penny.